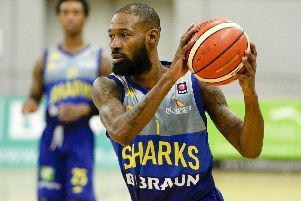 DBL Sharks Sheffield travel to Glasgow on Sunday hoping for a repeat of their 2013 British Basketball League Trophy final win over Leicester Riders. The Sharks, led by 25 points from BJ Holmes - including two Trophy-clinching free-throws - beat a high-flying Leicester side five years ago, and as in 2013 again face a Riders team which has swept all before it thus far in the BBL Championship. However, Sheffield will be buoyed by some encouraging performances against the Championship leaders this season - despite three defeats to the Riders so far in 2017/18, each time Sharks have come close to toppling their lofty opponents. Sharks were largely written off in 2013 but with the likes of Mackey McKnight, Chris Alexander, Dirk Williams and the evergreen Mike Tuck - who also captained the Sharks to their 2013 Trophy win - only a fool would discount Atiba Lyons’ side from winning this time around. Sharks edged past Worcester Wolves 161-152 on aggregate to reach their first silverware final since 2016, when they beat the Riders to lift the BBL Play-Off trophy at London’s O2 Arena, with Leicester earning their ticket to Sunday’s final with an aggregate win over London Lions. Sheffield Sharks head coach Atiba Lyons, on the back of a 75-64 defeat in a Trophy final dress rehearsal against the Riders in the BBL Championship last Friday, said: “I was disappointed with how we played on Friday. “We had too many turnovers and one of Leicester’s strengths is that they capitalise on any weakness so we need to eradicate unnecessary errors,” said the play-caller.